Low oil prices are sending Saudi Arabia debt levels to record highs in 2016, even though the Kingdom caused the price slump in the first place. As the largest producer in the world, Saudi Arabia wields the power to change the price of oil based solely on its output. Its decision to pump oil at a record pace has dragged prices down more than 60% in the last two years. The oil price crash began back in November 2014 when the country wanted to start taking market share away from the United States and Russia by increasing output. And the Kingdom isn't backing down from this strategy. In fact, it has said it will keep increasing production as a threat to one of its biggest competitors. And if the government follows through on this, global oil prices could move lower. That could also nearly double Saudi Arabia's debt by 2017. 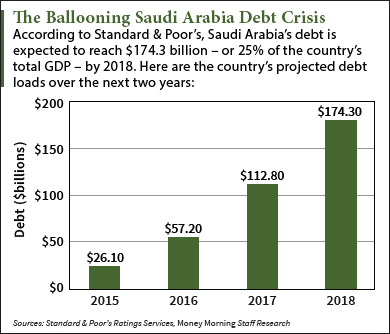 According to Standard & Poor's (S&P) – one of the Big Three rating agencies next to Moody's and Fitch – Saudi Arabia's debt is set to reach nearly $113 billion by 2017 if oil prices don't rebound. That makes up 17.3% of its projected GDP for that year and is almost double its projected 2016 debt of $57.2 billion. The climbing debt comes from the country's effect on oil prices. While the Saudis have produced an average of 10 million barrels a day over the last five months, Brent crude oil prices have fallen 8.7% over the same period. The Kingdom's decision to pump at a record pace has finally caught up with it. After downgrading the country's credit rating in February, S&P reported it doesn't expect Saudi Arabia debt levels to fall anytime soon. "In our view, the decline in oil prices will have a marked and lasting impact on Saudi Arabia's fiscal and economic indicators given its high dependence on oil," the agency said on Feb. 17. But its economy could spiral out of control if the Saudis follow through on their plan. In a Bloomberg interview on Saturday, Saudi Deputy Crown Prince Mohammed bin Salman said his country is prepared to immediately boost output to 11.5 million barrels. That would be a 13% increase from the 10.2 million a day produced in March. And the country wouldn't stop there. Salman also said the Saudis could raise nationwide output to 12.5 million barrels a day within the next six to nine months. "We can produce more," he told Bloomberg last weekend. "We can produce 20 million barrels of oil per day if we invested in production capacity, but we can't produce beyond 20 million." The comments targeted Saudi Arabia's geopolitical and religious rival, Iran. At the Doha meeting on April 17, plans for an output freeze among more than 15 oil nations collapsed after the Saudis refused to participate due to Iran's absence. This feud caused the talks to collapse and sent oil prices down more than 4% in just one day. Since then, many investors think every oil nation will flood the market and send prices lower. That's because the Kingdom's threats to boost output will make other producers pump more as well. After all, they would have nothing to lose. But Money Morning Global Energy Strategist Dr. Kent Moors – a 40-year oil market advisor for Russian, U.S., and Iraqi energy agencies – says the supply that's already in barrels and ready to go isn't the issue. In fact, the focus of the energy market is the oil in the ground because many countries simply aren't able to extract and export it right now. One of these countries is Iran, whose decades-old oil infrastructure is nowhere near ready to achieve the country's goal of 4 million barrels a day. "With the market apparently realizing that not all of this oil in the ground will be coming to market soon," Moors told Oil & Energy Investors yesterday (April 19), "the consensus among oil analysts is now that crude oil prices will be moving up into the high $50s by the end of the year." Moors agrees with those estimates. As of April 19, he projects Brent – the global price benchmark – to hit $48 to $50 by mid-June. In the United States, he sees West Texas Intermediate (WTI) reaching the $42 to $45 range by the same time. Stay tuned to Money Morning for updates to our crude oil price predictions. Follow us on Twitter and Facebook. Did you know the national debt is $19 trillion, $250 billion and goes up $100 billion every MONTH. $119 billion is CHUMP CHANGE!